I first encountered quiche as one of the breakfast offers in our favorite Portuguese bakery. 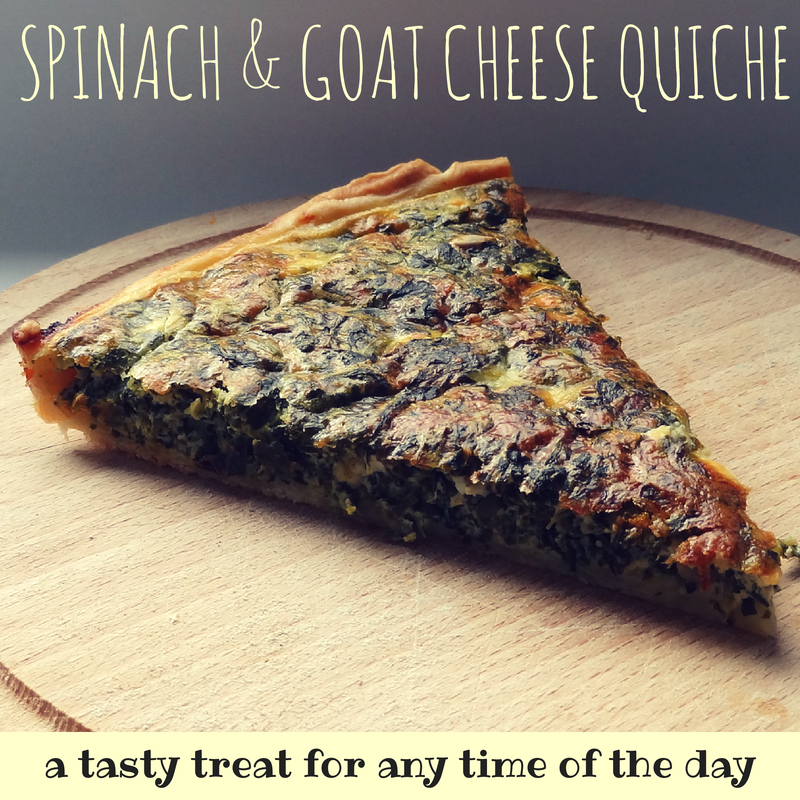 Hubby would often order a slice of quiche to accompany his breakfast mug of Galao with milk while I would opt for a toasted Portuguese croissant filled with some cheese, tomato, and rucola. Just thinking about it makes me hungry! It was not until recently that I started experimenting with making quiche myself. While the traditional quiche lorraine is pretty great I thought I could share with you my favorite version. This recipe is perfect: it is quick and easy to mix together so it fulfills my rules for cooking with baby, it tastes equally good hot from the oven or cooled in the fridge, and it works for any meal of the day. Lay out the shortcrust pastry dough in a large, shallow oven form, e.g., a quiche, pie, or tarte form approx. 30 cm in diameter. Whisk together eggs, goat cheese, sunflower seeds, Parmesan, and sour cream. Add spinach, stir well, and season with some salt and pepper. Fill in the pastry shell, place at the bottom of the oven and bake at 180 degrees C for 30-40 minutes until the quiche is golden brown. Make your own shortcrust pastry: knead 260 gr flour, 1 tsp salt, 130 gr butter, and 2 eggs. Cool in the fridge for 30 minutes, roll out, and lay in the form. If you choose to use fresh spinach, blanche them before adding to the mix. Serve with a green side salad tossed with some dressing, e.g., honey-mustard dressing: one part honey, one part mustard, one part virgin olive oil. Replace spinach with two medium sized zucchini.